An FBI investigation has linked deceased collector Barry Halper to stolen items from the NYPL. It all started a little over a year ago when this writer alerted the New York Public Library, the FBI and The New York Times that the Major League Baseball 2009 All-Star FanFest Auction included a “cache of rare 19th century letters” that had been stolen from the New York Public Library’s A. G. Spalding Baseball Collection. 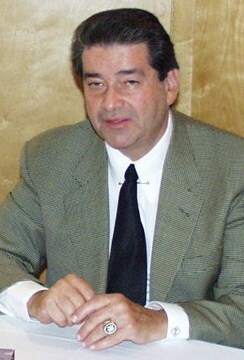 After New York Times reporter Jack Curry published three articles chronicling the prevailing suspicions and presenting proof that at least one of the letters was, indeed, stolen from the library’s Harry Wright Correspondence Collection, Hunt Auctions decided to remove the approximately fifty rare letters from the All-Star Game auction in St. Louis. The focus of the investigation is how three large scrapbook volumes, including close to two thousand 19th century documents and letters, disappeared from the NYPL in the years before 1983. The NYPL discovered that the three volumes were missing in 1983 when the Spalding Collection manuscript holdings were slated to be microfilmed. Only one scrapbook of the four-volume set, spanning the years 1878 to 1884, was found and microfilmed. Since 1983, Volume 1 (1865-77), Volume 3 (1884-89) and Volume 4 (1889-94), have all been designated by the library as “missing.” Industry experts estimate that the value of the missing scrapbooks, containing letters written by baseball immortals, is well in excess of one million dollars. In July of 2009, historian Dorothy Seymour Mills provided the FBI with key information in regard to specific letters in the MLB All-Star FanFest Auction. When she read Jack Curry’s on-line version of his New York Times article, she recognized one of the letters illustrated on her computer screen. It was a letter written to Harry Wright by banished ballplayer Jim Devlin, who was involved in one of the game’s first gambling scandals. Seymour-Mills and her husband Harold Seymour had utilized the NYPL collection for research in the 1950s. She identified the letter as the exact same one she had cited in her husband’s 1956 Cornell dissertation on early baseball history. It was a smoking gun, so to speak. At the time of the 2009 MLB auction, Seymour-Mills also informed Haulsofshame.com that the research notes she and her husband took at the NYPL were housed at Cornell University’s Rare and Manuscript Division as the “Seymour Papers Collection.” In August of 2009, Haulsofshame.com examined the Seymour Papers and found several vintage 1950s notes written by the Seymour’s that quoted verbatim passages from Wright letters featured in the 2009 MLB auction. The detailed notes even indicated which pages of the scrapbooks the letters were located. Lot 553,the Nov. 2, 1877 Jim Devlin letter, was once located in “Wright Corrres. 1 p.p. 44 and 45; Lot 262, the Dec. 25, 1877 letter from Pop Snyder, was once located in “Wright Corres. 1, p.57; and Lot 263, the Dec. 24, 1877 letter by Nick Young was found in volume 1 “Wright p.56,” etc. etc. In 1999, Barry Halper sold another 1877 letter addressed to Harry Wright from disgraced player Jim Devlin. It was one of 2,481 lots that generated over $21million in sales for the New York Yankee minority partner and super-collector. In addition to the Devlin letters there were others addressed to Harry Wright by baseball luminaries like A. G. Mills, A. J. Reach, Jim Mutrie and others. All of the documents bore evidence of having been removed from scrapbooks. When the New York Times reported that the letters offered in the 2009 MLB Auction were alleged to have been removed from the NYPL scrapbooks, they noted that all of the letters and documents offered for sale were attached to scrapbook pages and fragments of scrapbook pages. All of the evidence suggested they had originated from the missing NYPL scrapbooks. The last time these scrapbooks were documented as being at the library was in 1972 when author Irving Leitner reproduced letters from the Wright Correspondence, volumes 1 and 2, in his book, Diamonds in The Rough. He sourced the Wright materials and noted nowhere in his footnotes that they were incomplete and he even reproduced a portion of one of Jim Devlin’s letters to Wright. The infamous letters penned by Jim Devlin pleading to Harry Wright, for financial aid and reinstatement were documented and quoted in the 1960 book, Baseball: The Early Years (Oxford Univ. Press, 1960) by the Seymours, and in Diamonds in the Rough, by Irving Leitner in 1972. (In more recent times a Devlin letter to Wright was quoted in the PBS documentary film, Ken Burns: BASEBALL.) But, perhaps, the most important Devlin letter reference in relation to the FBI investigation of the NYPL thefts came in July, 1977, when a Devlin letter was mentioned in a profile of Barry Halper on the pages of The Sporting News. 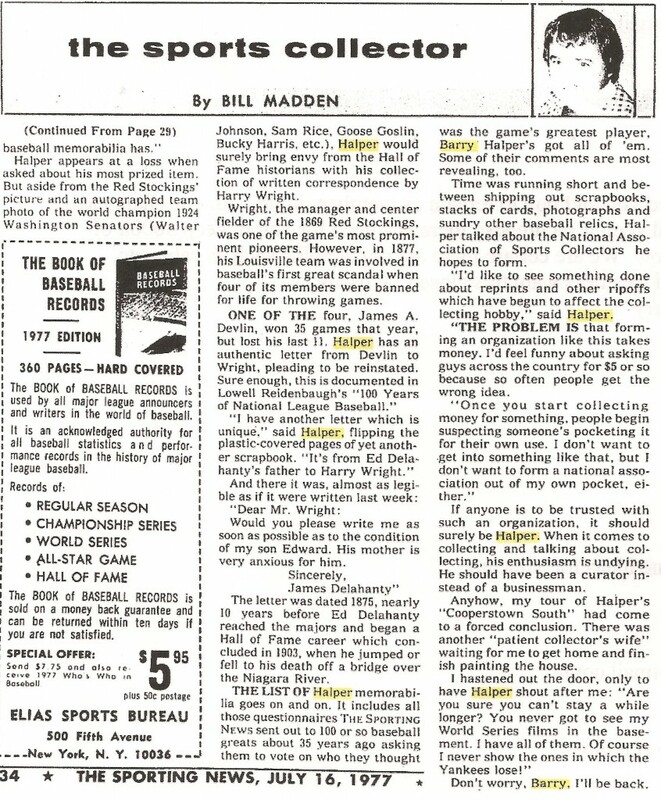 This Bill Madden column from The Sporting News verifies that collector Barry Halper owned items stolen from the NYPL's Spalding Collection as early as July of 1977. 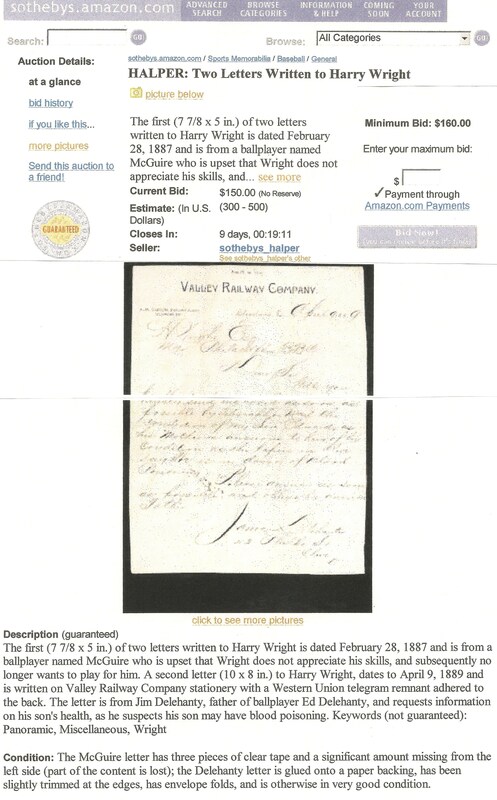 One group of items highlighted in the report was a grouping that Madden stated, “Would surely bring envy from the Hall of Fame historians.” It was Halper’s “collection of written correspondence by Harry Wright.” Madden mistakenly referred to the collection as letters written “by Wright,” but they were actually letters addressed to Wright as evidenced by his description of the items he held in his own hands. One of those items he described as “an authentic letter from (Jim) Devlin, pleading to be reinstated.” No further detail was given, but it is clear that the document Madden witnessed was either the Devlin letter Halper sold at Sotheby’s in 1999, or one of the two Devlin letters included in the 2009 MLB Auction. Would you please write me as soon as possible as to the condition of my son Edward. His mother is very anxious for him. Sotheby's offered an 1887 letter written by James Delahanty to Harry Wright as part of their Barry Halper-Amazon.com internet auction. The letter was referenced in a 1977 Sporting News article and was originally part of the NYPL's Spalding Collection. Halper apparently kept the Delahanty and McGuire letters in his sole possession from 1977 to 2000, when he sold them at Sotheby’s along with many other letters addressed to Harry Wright that appeared to have been removed from scrapbooks. Several of those Halper documents were also directly quoted in the 1950s research notes of Harold and Dorothy Seymour. What is most important about The Sporting News profile of Halper is that it establishes that the missing Harry Wright Correspondence collection (or a portion of it) was in his possession as early as July, 1977. So, sometime between 1972, when Irving Leitner published letters from Volumes 1 and 2 of the Wright Scrapbooks, and July 1977, when Halper showed off his binders to Madden, some one walked out of the New York Public Library’s 42nd St. branch with three volumes of unparalleled baseball history. Over the years, Halper sold off other letters written to Wright, one of which was written by Hall of Famer Ed Delahanty, himself, and offered for auction at Christies in 1992. Delahanty’s is one of the rarest Hall of Famer signatures sought by autograph collectors and a handwritten letter would be of the utmost rarity and value. In the past decade a controversial letter alleged to have been written by Delahanty was sold for over $30,000 by Hunt Auctions of Exton, PA. The letter had been authenticated by PSA/DNA and James Spence Authentication, but in one of the most embarrassing episodes of authentication incompetence the letter was exposed as a secretarial letter written by Delahanty’s manager Billy Shettsline. 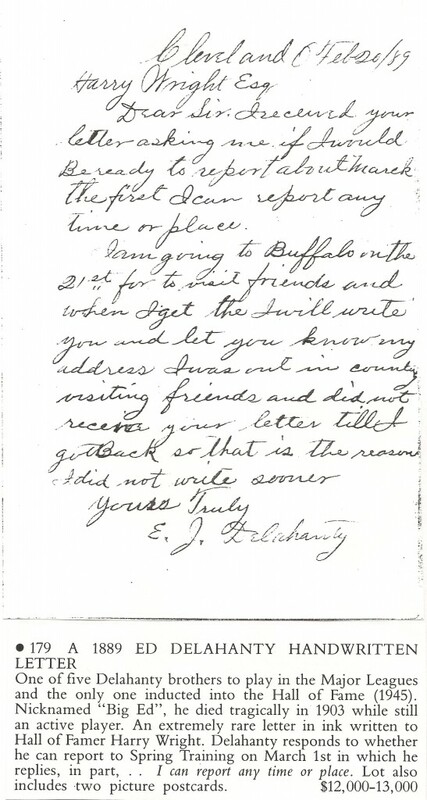 The name “Delahanty” was even misspelled as “D-e-l-e-h-a-n-t-y” on the $30,000 letter. The authenticators didn’t even note the misspelling in their letters of authenticity. Industry experts estimate that a legitimate Delahanty letter would fetch upwards of $50,000 if offered for sale at auction today. In addition to Ed Delahanty, Harry Wright managed other Hall of Famers including John Clarkson, Old Hoss Radbourn, Sam Thompson and Roger Connor. Evidence found in the NYPL’s volumes of file copies of Wright’s outgoing correspondence suggests that letters from these legends may also have been included in the missing NYPL scrapbooks. Industry experts estimate the value of each of these letters in excess of $50,000 as well. 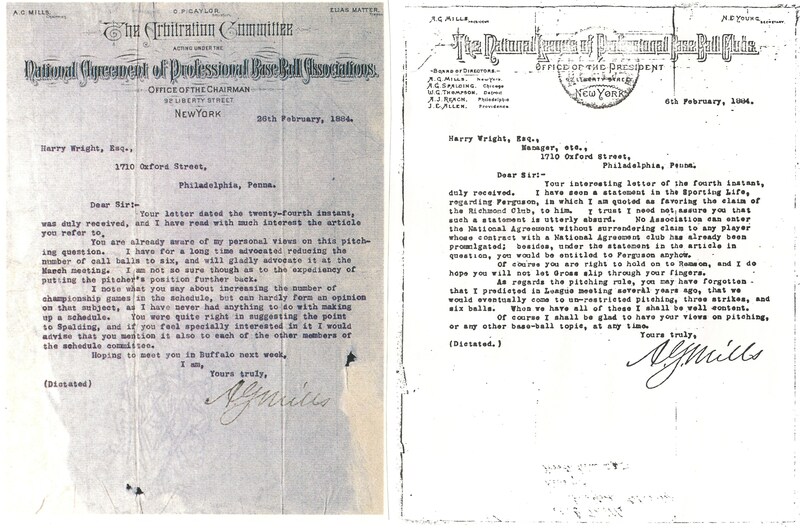 This rare 1889 letter written to Harry Wright by Hall of Famer Ed Delahanty appeared in a Christies Auction in 1992. -How did three large scrapbook volumes packed with thousands of documents find their way out of the NYPL’s doors sometime between 1972 and July, 1977? -How did Barry Halper acquire his large cache of mangled letters and trimmed scrapbook pages placed in plastic sheets and binders, which were stored on the shelves of his suburban Livingston, New Jersey home? -Were the three missing NYPL Wright Correspondence scrapbooks totally, or just partially, dismantled? -What dealers specialized in supplying rare 19th century artifacts for Halper’s collection from 1973 to 1977? -Where are the hundreds of other Wright documents that were originally pasted into the three missing NYPL scrapbook volumes? -How did the 2009 MLB auction “cache” of fifty or so Wright letters get into the hands of the person who consigned them to the auction? The FBI knows who the MLB/Hunt Auctions consignor is, but they will not reveal his identity. One thing they know for sure is that the consignor’s story to Hunt Auctions head David Hunt is highly suspicious. Hunt told the New York Times that his consignor, “consigned the items, saying that the letters had come from a grandparent’s estate.” That would mean that the consignor’s grandparents could have stolen the letters from NYPL themselves or, perhaps, may have purchased them from Barry Halper or some other person. So who was the Hunt consignor, and what is his story now? When contacted, David Hunt, president of Hunt Auctions, said he was, “not at liberty to discuss the identity of his consignor.” Hunt also stated he has been cooperating with the FBI in the course of their year-long investigation. 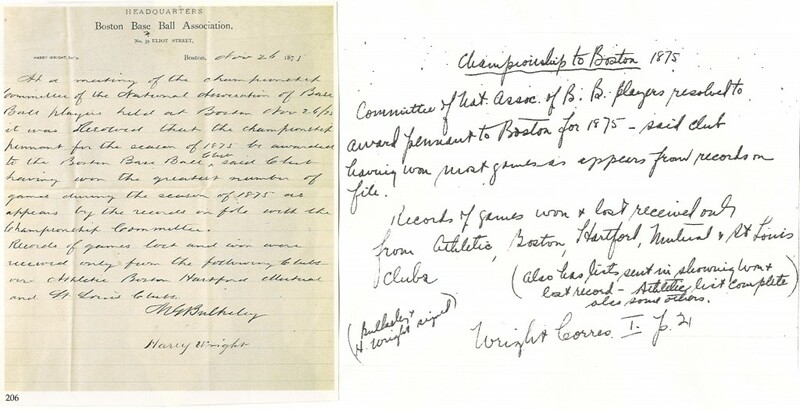 (Left) Page from report presented to FBI illustrating that Lot 262 in the 2009 MLB/Hunt Auction, a letter written by Nick Young to Harry Wright originated from the missing NYPL scrapbooks. Young wrote that player Pop Snyder, "has too much 'chin music' some times." Historian Harold Seymour quoted the same letter from "p. 57" of Wright Scrapbook Vol. 1. Seymour wrote, "he has too much 'chin music' at times." (Right) Another page from the report illustrating that Lot 263, a Pop Snyder contract, was originally located in Wright Scrapbook Vol. 1, "p.66." In addition, the report also offered evidence that would aid the CSI-like angles of the Federal probe into the mystery of the stolen Harry Wright Letters. Haulsofshame.com was able to determine that all of Harry Wright’s Correspondence arrived as a donation to the NYPL in 1921, housed in envelopes as loose, unattached documents. Examination of the one remaining Harry Wright Correspondence Scrapbook, Volume 2, revealed dated NYPL stamps showing that the scrapbooks containing the Wright letters were constructed by the library in August of 1921. Thus, forensic and chemical analysis of the MLB/Hunt Auction letters, the Halper/Sotheby’s Auction letters and all others that have surfaced in the marketplace should help prove that all of the Harry Wright letters originated from the same NYPL-constructed scrapbooks; with the same scrapbook paper backing and using the same adhesive materials. Shortly after the FBI commenced their investigation they came into possession of other Wright letters that had appeared in recent auctions. Letters from Al Reach and George Stallings, attached to similar scrapbook paper backings, have been available for forensic testing since last summer. As evidenced by the 1977 Sporting News profile of Halper, it is believed that the three missing scrapbooks may have been totally dismantled. It was well-known by collectors and dealers that Halper housed his correspondence and document collections in binders filled with plastic sheets. Evidence suggests that Halper’s Wright Correspondence scrapbook pages were trimmed down to fit in his plastic sheets. 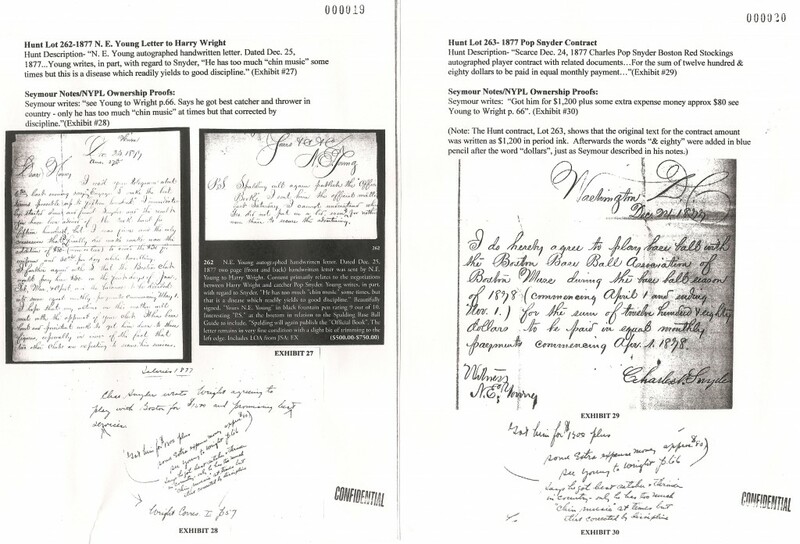 Another common link between the documents still housed at NYPL and the lettters sold by Hunt in 2009 and by Sotheby’s in 1999, is evidence showing that each document has notations added in Harry Wright’s own handwriting (or his secretary’s) indicating an identification of each letter for filing purposes. These notations designated the sender, date and other information distinguishing what type of document it was. These filing notes were common in the 19th century and further suggest that all of the suspect Wright documents sold publicly were once part of the entire archive that Wright bequeathed to the National League in 1896, and ended up at the NYPL in 1921. I appreciate being credited with helping in the search for the missing valuable baseball documents, even though my help was limited to recognizing materials I had used in the writing I did with my late husband. It’s appalling to think that and American citizen who loved baseball might destroy the historical heritage of all of us by stealing and hoarding all this material for himself and making money on it. Great article. Someone out there must be sitting on quite the stash of Harry Wright letters. As Dorothy said, this citizen might have loved baseball too much, but in the end, this was just shoplifting taken to its highest level. Does anyone think its weird that Halper publicly talked about Stolen Goods? If i stole or recieved stolen goods, i dont think i would brag about them. Could he have suffered from extreme nieveness? Great article – please continue the important work of not taking everything at face value and doing your research. I remember reading the articles on Barry Halper in the 80s and 90s and thinking he was the ultimate collector, but it is turning out not to be the case, first how he built his collection, and second, how he determined what to add to the collection, with the non-authentic items. I think that we need to be careful about demonizing Barry Halper. Unless I am missing something, I don’t see any evidence showing that Mr. Halper knew the Wright letters were stolen from the NYPL. He may have just innocently purchased the letters for his collection. Its pretty obvious by now that Halper was a man born without conscience. As for assertions that Halper may have innocently purchased the letters, I would assert that either he was incredibly foolish to not ask for the origin or authenticity of the items, or he indeed did know where they came from and could not care less, which is the modus operandi of many hoarders. Either way, the evidence against Barry Halper is mounting. This is absolutely mind numbing investigative work. Peter J. Nash and those like him should be commended for their dedication and love of the National Pastime. Mr Halper seems to have either had a mental disease or he was both complicit and compliant in both theft & fraud. Justin, what better way to throw people off the scent than to admit a small part of the larger picture?